This charming picture book is the second from Jennifer Fosberry and Mike Litwin. 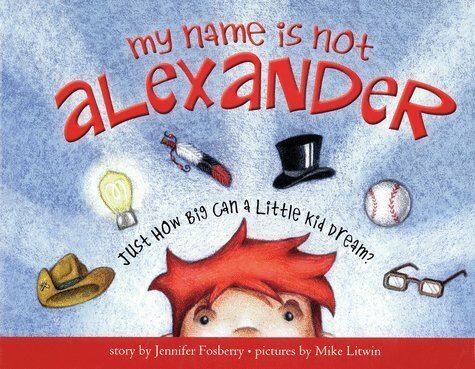 My Name Is Not Alexander traces discrete events in a young boy’s day as he interacts with his father, inspired throughout by various American historical figures. Enjoyable, colorful illustrations depict the imaginative young Alexander—or, perhaps, “Not Alexander”—taking on the persona of a different male hero. Alexander concludes his day’s adventures by stepping, literally, into some very special shoes before he falls asleep in one final, precious role. The book replicates the structure and pattern of Ms. Fosberry and Mr. Litwin’s previous work, My Name Is Not Isabella, in which Isabella embodies various female heroes in the course of a day with her mother. The clever and fun illustrations allow children to recognize Alexander clearly while he is in the guise of his hero of the moment. Mr. Litwin’s pictures and text illustrations do a wonderful job of complementing the words Ms. Fosberry selects to describe the importance of each hero. There is no doubt that some of the historical references, at least initially, will be lost on the younger end of the target audience. This really is of no consequence, though, as the book works well on the level of a humorous and imaginative picture book, even without regard to the significance of each or Alexander’s character choices. The older set, and American children in particular, might already have an appreciation for some of the historical figures depicted. To supplement this, a cheerfully written two-page appendix offers pictures of and summaries of the achievements and significance of each of Alexander’s heroes. This is also a useful reference for parents when reading with younger children. Finally, a list of websites and books the author consulted in her research give children the opportunity to read further about these and other male heroes. My Name Is Not Alexander is at once a sweet, gentle history lesson and a delightful bedtime read. Alexander’s imagination and the amusing illustrations make this an entertaining and informative choice.